Having a Will is an essential part of an estate plan. A will directs how your probate assets will be distributed upon your passing, designates an executor to be in charge of your estate, and allows you to create trusts for minor grandchildren or disabled beneficiaries. However, having a will is just part of the story. Here are five things that impact your estate beyond your Will. Joint Bank Accounts: Most joint bank accounts are set up as “joint with rights of survivorship,” meaning that if one of the owners passes away, the other owner automatically inherits the whole account. As such, all assets in the account will pass to that joint account holder, regardless of what the decedent’s Will says. If you add a child to an account for convenience or access, you may be unintentionally leaving more money to that child. Better to let a trusted child help you via a Power of Attorney (see below). Beneficiary Designations: Many assets pass outside of your Will because they have specific beneficiaries. Most retirement accounts (401(k), 403(b) and IRA accounts, for example), life insurance, and annuities pass to the beneficiaries you name when you set up the account. Bank accounts and brokerage accounts can also be set up with beneficiaries, such as POD (payable on death) or TOD (transfer on death). For all of these assets, you can designate both primary beneficiaries and contingent beneficiaries. Health Care Crisis: No matter what your will says, if you haven’t taken steps to protect assets, a health care crisis can wipe out a family’s assets on the cost of care, including nursing home care or home health care. Placing assets into an irrevocable trust will protect those assets once five years have passed. The assets can then be left to your heirs and beneficiaries instead of being spent down on the cost of your care. Many families place their home into a trust as it is their largest asset. This can be accomplished while keeping the right to live in the home during your lifetime, retaining your STAR and Veteran’s exemptions, and even securing capital gains advantages for your heirs. During your lifetime, you will still be able to sell the property, buy a new house or invest the sale proceeds/cash if you prefer – and all the while those assets will be protected once the five years have passed. Gifts: If you give someone a gift, it is no longer part of your estate and will not pass under your Will. Many people are familiar with the IRS “annual exclusion” gift, whereby an individual is permitted to make a gift in the amount of $15,000 per year to a beneficiary without incurring any gift tax consequences. However, if you need Medicaid coverage within five years, this gift will trigger a waiting period before you can be eligible for Medicaid benefits. While the gift is permissible for IRS purposes, it most definitely is not for Medicaid purposes. This mistake and its consequences can be quite costly. The better – and safer – plan is to place assets into an irrevocable trust. Power of Attorney: Estate planning is not complete without naming an agent to act for you if you become incapacitated. A durable power of attorney is a legal document wherein your appointed agent has authority to handle banking matters, real estate transactions and other matters of a financial nature on your behalf. Drawing up a will is an important step in creating an estate plan but there are many other factors to be taken into account. Speak to an experienced elder law and estate planning attorney to make sure your wishes are carried out and your family is protected. Marcus O’Toole-Gelo, Esq. 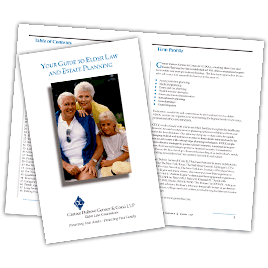 is a senior associate at the elder law and estate planning firm of Genser Cona Elder Law. Marcus is a member of the Trust and Estates Department, concentrating his practice in the areas of estate planning, trust and estate administration, probate, tax planning, business succession planning, trust administration and estate litigation.